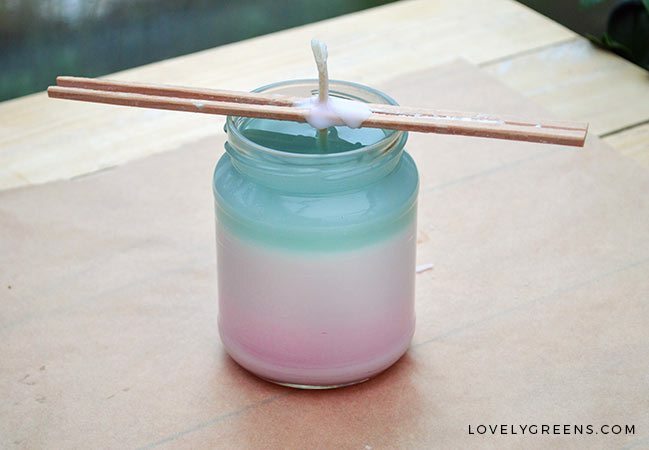 How to make ombre candles that change in scent as they change with color. This is an all natural recipe using soy wax and essential oil fragrance. What if you could make a natural essential oil candle that changes fragrance and color as you burn it? It’s a lot easier to do than you would think. 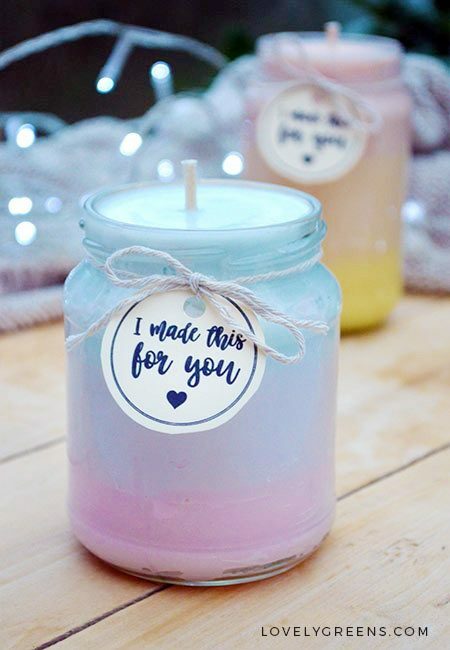 Making ombre candles with complimenting colors is the first step, choosing essential oils that smell lovely on their own and blended together is the second. This DIY candle project will take you about 45 minutes to an hour. The directions and recipe is to make one of the candles pictured but you could bulk up the recipe to create three or more at a time. 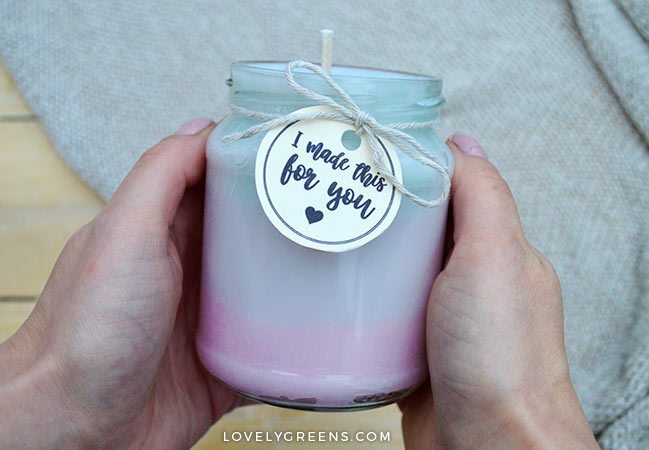 The ingredients and materials you’ll need to make ombre candles include jars, wax, color, fragrance, and wick. You’ll also need a few key pieces of equipment — notably a digital thermometer. For the three candles I used essential oils that will blend together harmoniously as they burn. You’ll need 5g (about 1/4 tsp) of essential oil for each half of the candle wax. Using essential oils will give you a much subtler scent than using candle fragrance oils. If you want a truly strong scented candle, use fragrance oils. Here’s a fab set of holiday fragrances. If you’d like a sampler of fruity fragrances, this set could go really well with the ombre colours. There are a lot of wicks on the market but not all are suitable for this project. 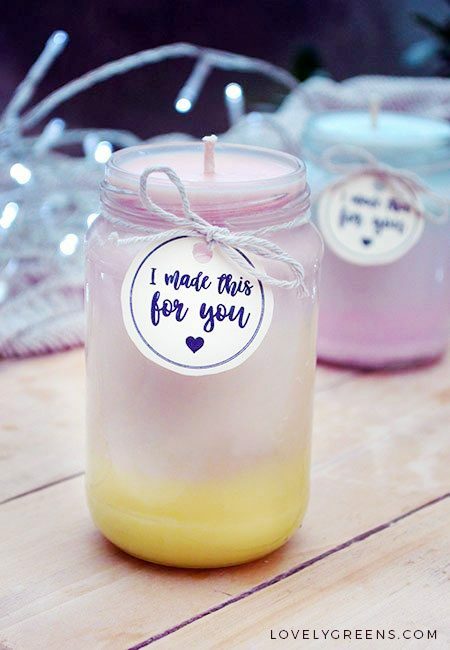 You’ll need wick that’s ideal for soy wax and that will have a burn pool as wide as the jars you’re using. The burn pool is how far from the wick the wax will melt. Choose the incorrect one and the wick won’t burn the candle edge to edge. You could be left with a tunnel down the center. 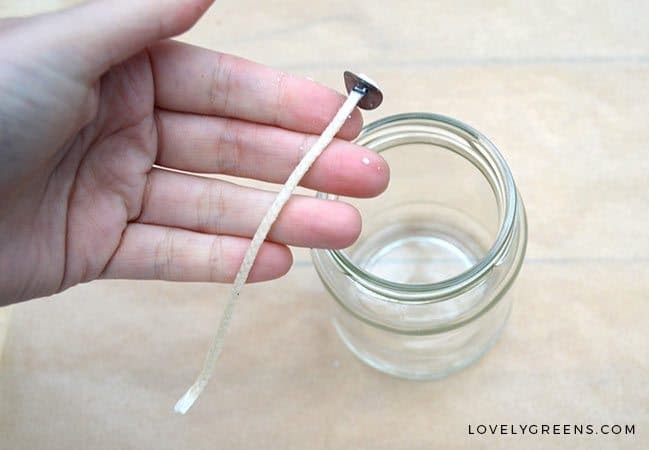 Cut the wick so that it’s long enough to fit the entire length of the jar and then an extra inch. Fit the metal sustainer on the bottom and clamp it using a pair of pliers. Measure 150g (5.25oz) soy wax into each of two stainless steel pans. Add a chip of color* to each about the 3/4 the size of your thumbnail or smaller and melt using the double boiler method. While the wax is melting, drop the wick into the melted wax. Leave it to soak for a minute or two and then fish it out, straighten it, and allow to dry. Fit the wick into your empty jar using the Blue Tak or a specialty candle making glue tab. It goes on the bottom of the sustainer and the chopsticks will help you press it onto the bottom of the jar. Then use the chopsticks to center the wick on top. When the wax is fully melted, take the pans off the heat and let cool. Turn off your hobs but keep the pans of hot water at the ready. * Adding more than this will run the risk of the soy wax ‘Frosting’. This is a kind of white haze that can appear on the surface and sides of the candle. It doesn’t stop the candle from functioning but it may be an effect that you don’t want. Cool the wax to 130°F (54°C) and then add the essential oil. 5g of one into one pot, and 5g of the other into the other. Mix well with the wooden skewers and then decide which color you want for the bottom of your candle. Pour half of the wax from that pan into the jar and allow to cool. You can speed up the next steps by popping the candle in the fridge. 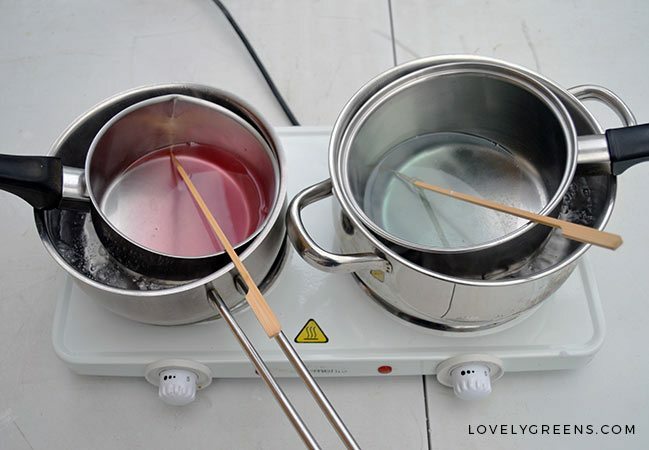 While the first layer of candle wax is cooling, mix your coloured wax. One pan is completely full and the second is half-full since you’ve just poured some of that into the jar. Pour half of the full pan’s wax into the other pan and mix. It will be the gradient change layer in your candle. When you pour each layer of wax it should be between 125-130°F (51-54°C). You keep the pots of wax warm by setting them in the heated pans of water which will retain heat for some time after you turn off the hob. 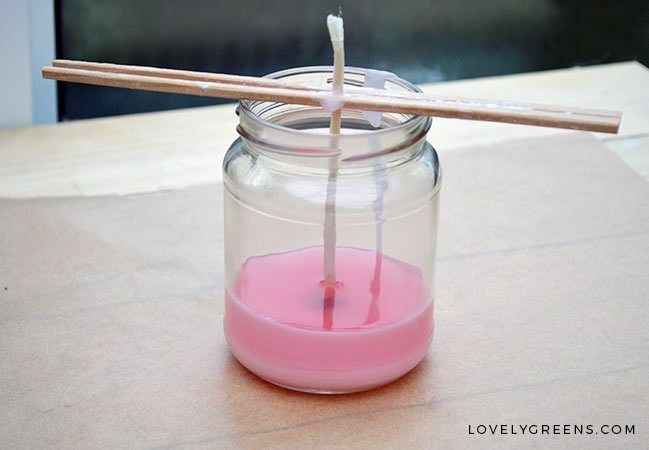 When the first layer of candle wax has hardened to form a thin skin on its surface, pour the second layer. Now allow the second layer to cool in the same way as you already did with the first. Keep the last pan of wax at the ready. When the middle layer has hardened, pour the last layer of colored wax up to 1/4″ from the top of the jar. Now leave the candle untouched until it’s hardened but still warm to the touch. The final but optional step is to further blend the layers. If you’d like a more gradual gradient from one to the next, the candle will need to be melted a little*. Pre-heat the oven on to 200°F (100°C). Set the candle inside and leave it for 5-10 minutes or until you see the top beginning to melt. Turn the oven off, open the oven’s door, and let the candle cool to room temperature inside the oven. Leave the candle there until you’re sure the top is hardened enough that it won’t slosh around. You can then move it to a kitchen surface to finish cooling to room temperature. * If you notice that your candle has some hazing, please be aware that oven heating may cause it to become worse. If the surface of your candle isn’t smooth, you can use a heat gun to melt the surface to a nicer finish. Soy wax also has a tendency to pull away from the insides of glass containers. If it has with yours, don’t be too concerned — it’s a part of using natural additive-free waxes. 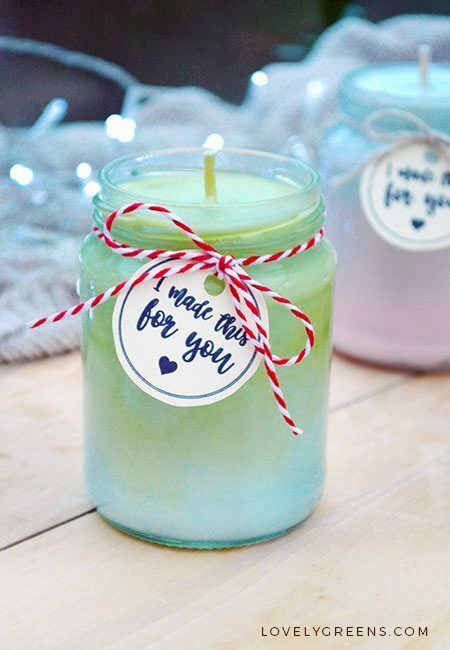 When your candle is room temperature, cut the wick to be 1/4″ tall and tie a pretty label on with string. You can use soy wax candles a day after they’re made so they’re a fun and convenient handmade gift to hand out for birthdays, holidays, or just because. 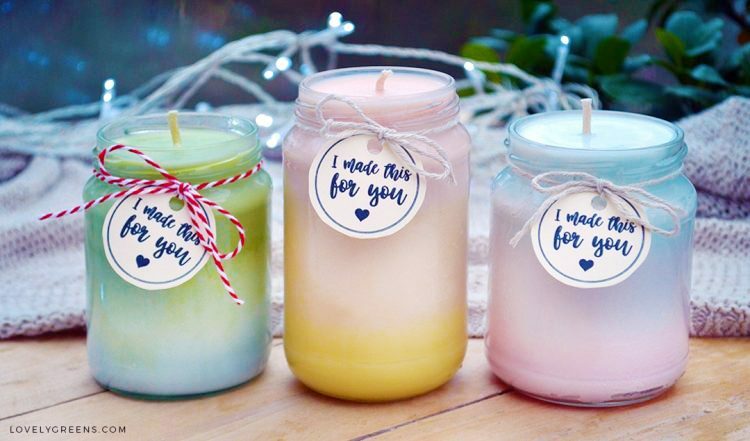 I think your friends and family will be impressed and delighted to receive one of your own handmade ombre candles! If you liked this tutorial, you should also check out my project for cut wine bottle candles. I also have a piece showing how to use essential oils to scent handmade soap.